Every lifter is built of steel in their early years, regardless of whether they train smart or max out on Smith machine bench press four days a week without ever doing a single pull-up. But as guys push their thirties, forties, and beyond, the aches and pains tend to pile up. One day it’s the elbows talking back after bench; the next it’s the knees after squats. Despite not doing anything different – or perhaps as a consequence – suddenly everything hurts. We all want to train for a long time, so why not start planning for the future now? Just a few simple modifications to your current training will undoubtedly have a huge impact on your entire body years down the line. 1. Prioritize the use of free weight implements like barbells, dumbbells, kettlebells, sleds, and your own bodyweight over machine training. Sure, there’s a time and place for all modalities, and fixed-axis equipment will certainly get you bigger and stronger. However, the stability demands of free weights give them the edge over machines when it comes to longevity. 2. Perform the same lift no more than once or twice per week. Muscles, tendons, and ligaments need adequate time to recover from the stresses imposed by training – even if it doesn’t feel like it. Now, this doesn’t mean you can’t train the same basic movements multiple sessions per week. You just have to choose different exercises. For example, if you flat bench on Monday, then on Thursday you might do incline bench or push-ups with a weighted vest. 3. Balance the frequency of upper body pushing and pulling, as well as lower body hip- and knee-dominant lifts. Huge pecs but no lats doesn’t just look wimpy; it’s also a recipe for future rotator cuff issues. Incorporating more pulling – up to or exceeding a one-to-one ratio of posterior to anterior chain exercises – will not only ward off injury and improve posture, but it also might even increase your bench. After all, you’re only as strong as your weakest link. 4. Limit overhead movements (i.e. snatches, pull-ups, overhead press, and Turkish get-ups) to one per workout. If your shoulder and thoracic mobility aren’t great – and many lifters’ aren’t – then when you get fatigued, the stress gets shifted to the passive structures of the shoulder. Sticking to a single overhead exercise each workout keeps you stimulating all the muscles you intend to and fewer of the ones you don’t. 5. Reserve 1 RM’s for only a few times per year. Keep to the 3-5 rep range the rest of the time for your strength work. You’re still getting the same training effect, all with a dramatically reduced risk of breakdown in form and, consequently, injury. In addition, try not to miss too many lifts. It’s bound to happen once in a while, but in the long run you’re better off stopping one rep short than attempting one rep too many. There’s always next time. A good warm-up includes muscle and central nervous system activation, along with a few light sets of the target exercises of the workout. First, “turn on” dormant muscles like the glutes and lower traps with some low intensity bridges and raises, respectively. Next, wake up the CNS with a few reps each of squat jumps and plyometric push-ups. Finally, do a set of 10 of the first couple of exercises of the workout with just bodyweight or an unloaded bar, concentrating on grooving technique for the heavier stuff to come. 1. Insist on full range of motion, even if it means reducing the load. Working through a partial ROM might boost your ego in the short term, but give it a few decades, and you’ll merely wind up with joint pain and an inability to control your squat deep enough to do things like use the bathroom on your own. 2. Adopt a neutral or freely rotating grip for most lifts. If holding the barbell in place is the most torturous part of squatting, simply switch over to a safety bar. If you look like a camel when you deadlift due to the forward pull of the bar, grab a hex bar. The neutral grip allows the weight to flow more directly through your body, making for a friendlier and more comfortable pull. For neutral grip bench and overhead press, invest in a football bar. 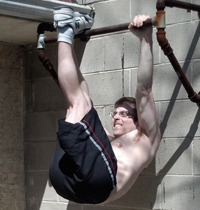 For pull-ups and inverted rows, use rings, or make your own rotating grip by looping nylon cable handles around a bar. 3. To take stress off the elbows and knees when pulling and squatting, initiate the movements from the joint above. For pull-ups and rows, concentrate on squeezing your shoulder blades together before bending your elbows. When you squat, begin by sitting back with your hips. The knee bend should be a natural consequence of the hip movement, not the primarily intent. 4. Maintain control over the weight throughout the entire lift. Actively use your muscles, not momentum, to reverse the direction of the bar at the bottom of the squat, deadlift, and bench. By allowing your muscles to go lax on the eccentric to concentric transition, your joints can take a big hit. At the bottom of the squat, it’s the knees that are forced to decelerate the load. On bench and deadlift, it’s the elbows and lumbar spine, respectively, that experience huge forces trying to get the weight back under control. 5. Keep joints – wrists and neck in particular – stacked. Do not let the position of your wrists or neck deviate too far from neutral. On bench and overhead press, be careful not to allow the load to bend your wrists backwards. At the neck, watch out for chin poking; keep the neck in line with the rest of your body at all times. 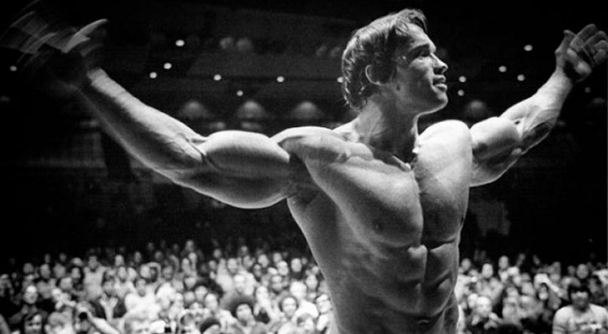 When squatting, feel free to look up with your eyes, just not your entire head. Finally, beware of going behind the neck on vertical pushing and pulling. Ensure you have adequate mobility for it, or risk winding up with a nasty migraine from improper cervical flexion. Below is a sample three-day training program. The premise is simple: each full-body workout has a push and a pull, along with a hip- and a knee-dominant lift (one of which is unilateral). Sets and reps are given as large ranges to accommodate diverse training goals. Clustering exercises, as indicated by A1/A2, is encouraged in order to cut down on time and increase the metabolic effect. Throw in direct arm and core training as desired. After all, there’s certainly nothing wrong with being the old guy with abs of steel and 18-inch arms. Travis Pollen is a personal trainer and American record-holding Paralympic swimmer. He is currently pursuing his Masters degree in Biomechanics and Movement Science at the University of Delaware. Travis has been featured on T-Nation.com and move-everywhere.com.